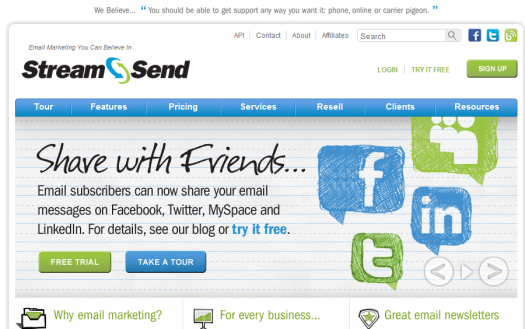 StreamSend Review: Email Marketing You Can Believe In? StreamSend advertises itself as an easy alternative to the bigger names in email marketing – your AWebers, for example – and this is a promise that always delights a reviewer. If it delivers on the promise, it can be an excellent recommendation to make: something off the beaten path for you, the audience to enjoy. Does StreamSend deliver on its promise? That, of course, is in the eye of the beholder, but for the purposes of this review, we can get a few hints and tell-tale signs of a good service by giving it a solid once-over and exploring all of its inner workings to reveal a snapshot of the service as a whole. As it turns out, StreamSend is a quality service that is a bit overshadowed by some of its well-equipped competition. But before we get into that, let’s weigh some of the basic features and facts every potential customer wants to be aware of before making their purchasing decision. This StreamSend review would be remiss if it didn’t handle your most basic of questions. What I really found enjoyable about StreamSend is just how feature-rich it really is. It’s got a litany of quality features which you can explore for yourself) that make it an attractive option if you’re still working through your list of potential email marketing platforms. Examples? Heck, why don’t we just go through the litany right now? The email-crafting features: Here is where StreamSend really starts to stand out. Not because any particular feature reinvents the wheel, but because they keep on piling the features until the sum total is actually greater than the sum of the individual parts. Here you’ll find features like editing reply-to options, email testing to ensure that your email isn’t caught by spam filters, and image and logo uploading. Of course you’ll have the usual features here like choosing HTML templates with which you craft your email, as well. The marketing features: A step above these other features, solid marketing is integral to the process of establishing a strong email list. Real-time analytics are important here, especially if you want to track a large campaign and can’t turn away from your own dashboard to see the instant results. Integrating Google Analytics with your e-mails is also a great way to ensure that you measure everything you want measured – especially if you integrate it with the Google Analytics already running on your existing web site. Again, none of these features in and of themselves – cool as they might be – really tip the scales in one way or another. But the overall cumulative effect is that StreamSend puts together a solid sales pitch in its “features” section. Yes, you’ll find many of these other features elsewhere. But StreamSend packages them together nicely and keeps them all within a click or two away of your control panel. It’s quite the site to behold, and definitely a major plus. Of course, StreamSend wouldn’t be an email marketing platform unless it had a rigid pricing structure that annoys me on a personal level. I’m not sure what it is in the genetics of the email marketing world that requires the multi-tier pricing plan, but it certainly seems like it’s here to stay. Personal feelings aside, however, here are the basic facts surrounding the pricing structure at StreamSend. Confused? So am I, but it looks to me like the raw numbers stack up fairly evenly with the other email marketing services out there. There is a free 30-day trial available, which is a great way to start out the service and tell if you really like the way StreamSend handles your subscription list, but after that, you’re going to be at the whim of the StreamSend pricing structure. Such is life as an email marketer. By the way, each pricing tier has a flat “additional per 1,000” emails pricing plan in place. For example, on the first tier ($19.90/month), you’ll have to pay $5.00 per 1,000 additional emails. Really? Not the greatest selling point in the world, and reason enough the beginner might want to consider a pricing structure with a flatter rate. If you’re going to go solely on the basis of our recommendations, you’ll want to gravitate more to an iContact than a StreamSend. The pricing structure there is more predictable and the features should be enough for you to handle. But we recognize that our final word is not the final word int he world of email marketing. So, if we may do so humbly, we’d like to suggest a general plan of attack for considering which email campaign manager is right for you. Write down your list of top two or three features you want to see out of your email marketing site. Low price? Attractive HTML templates? Think of anything you can and rank the two most important. If “price” is important to you, you can probably skip StreamSend. There are longer and better free trials available out there, and StreamSend’s nice features can be found in other platforms with a little additional research on your part. It’s not that we hate StreamSend; we just get too turned off by complicated and annoying pricing to deal with it. When there are better options out there, pricing becomes that much more important. Besides, aren’t times tough enough that we shouldn’t have to worry about how much we’re spending on email marketing?